Step 1 - Look at existing trends. In other words, what's the current thinking about the future. Steps 2 & 3 - Seek out "weak signals" and then extrapolate them into a vision of the future. Steps 4 & 5 - Assemble a scenario, then 'backcast' to see what has to happen for us to get there." But if we were going to apply the IRI model to our B2B marketing R&D, what would we find? Step 1 would yield unequivocal confirmation that traditional B2B business development and marketing tactics are decreasingly effective. And that internet marketing (an overly broad term that encompasses many tactics to be integrated) is where resources are focused among businesses with advanced KPIs that let them manage proactively. Step 2 is tough - the 'noise' is overwhelming. But one weak signal is recurring. Internet marketing is an incredible leveler - between organizations of vastly different size; and between regions, nations and continents. Internet marketing is global marketing. As we extrapolate in Step 3, it's clear that this trend accelerates. As technology advances and traditional barriers to global sales (logistics, language & communications, payment & FX) are minimized, and as emerging and frontier markets seek to gain access to the seductive US market, savvy entrepreneurs and marketers will progressively refine global internet marketing approaches to the point that arbitrary borders will become largely inconsequential to trade. The scenario we assemble in Step 4 is pretty simple. Nearly every company will have the ability to be global. Many will seize the opportunity. And many others will fail to. But creative application and relentless execution of global inbound marketing best practices will become one of the defining attributes of thriving companies - and a discriminator of those which will wither. And how do we get there? If Step 5 requires a roadmap, we can only project the rough direction and distance - for the intricacies, twists and turns will certainly surprise us along the way. But the macro journey is clear. A global mindset is a prerequisite, as is escape velocity to overcome the gravity of tradition. I recently caught up with David Meerman Scott (@DMScott) during a brief lull in his hectic global travel schedule, and chatted over coffee about the global application of internet marketing. Our conversation covered a wide range of topics and perspectives (more to follow in another article in the near future) but we spent much of our time focused on the opportunity which lies at the nexus of rapidly evolving internet marketing (and access) and the increased feasibility for businesses of all sizes to expand globally. This was a critical point on which I wanted his perspective - because his vantage point in this area is pretty unique. As he is simultaneously recognized for his expertise and insight into the world of internet marketing, and has exceptionally international experience, I knew that he would have a particularly incisive perspective. He did. Looking at the question from a variety of different angles we kept coming to the same point. Agreeing that most companies, and especially those in the US who have traditionally enjoyed a vast and profitable domestic market, neither fully recognize nor leverage the opportunity, David kept circling back to one of his main theorems. "We're still really, really early." So that's good and bad news. For you skeptical types, you're right. As the research I recapped earlier this week highlighted, we're not yet close to identifying "best practices. We're learning as we go (although for sure some of us learn faster and incorporate those lessons into execution more effectively) and the rules of internet marketing are still being written. But for you optimistic (and opportunistic) types, you're right too. There is an ENORMOUS opportunity which awaits you at the intersection of global inbound marketing and international sales growth. 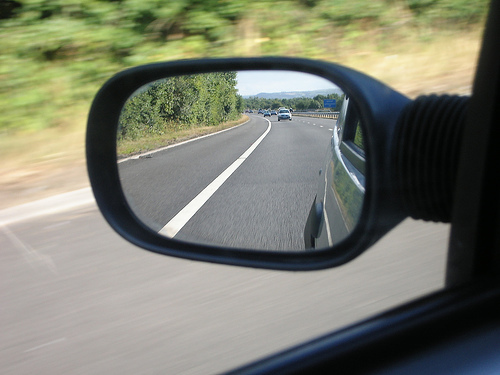 Just as the road ahead blurs as you watch your pursuers in your rear view mirror, continuing to predicate your business development strategy on traditional tactics of cold-calling, register listings, direct mail & trade shows will distort the opportunities ahead. Similarly, continuing to focus solely on your domestic market will preclude focus on viable, strategically sound, global market expansion opportunities. Sure, being "really early" may be a bit risky....but there's less competition, and no risk of getting the timing wrong and being too late. But maybe you'd rather bet your company. If you want to be early together (really, really early) and to look forward, start by downloading your free "Essential Step-by-Step Guide to Internet Marketing" below.